Football Association chairman Greg Dyke says Fifa is "like a soap opera", after president Sepp Blatter was questioned as part of a Swiss criminal inquiry. Blatter, 79, is accused of signing a contract that was "unfavourable" to world football's governing body and making a "disloyal payment" to Uefa president Michel Platini. 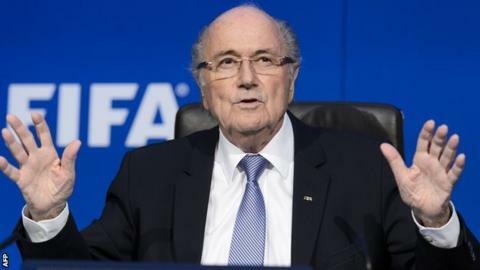 Blatter denies any wrongdoing and his lawyer says he is co-operating fully. "Clearly the organisation is in chaos," Dyke told the BBC. "Fifa are completely falling apart at this moment. You can date the unravelling back to the extraordinary decision to award the World Cup to Qatar. At this point they are now facing two police investigations, both by the Swiss and the Americans. "The US Department of Justice is absolutely ruthless and is able to prosecute all over the world based on the fact that these are dollar transactions and that gives them jurisdiction. "It's time for Sepp Blatter to step down completely. His position is not sustainable." "What is important is that we have a proper reform programme so that we don't ever see Fifa in this state again," he added. Prince Ali bin al-Hussein of Jordan, who stood against Blatter in the last Fifa presidential election in May and will run at the next election in February, said the developments underlined the "need for new leadership". He added: "We have to accept that changing Fifa is not a matter of choice; it has already changed, shaken to its very core by the scandals that have decimated our governing body and cast a cloud over the entire organisation. "We have a duty to use our expertise, our experience, and our knowledge to lift that cloud by taking action to demonstrate that Fifa is worthy of the sport it oversees on behalf of the players, the fans and the millions of young boys and girls who can benefit from it." Gordon Taylor, the chief executive of the Professional Footballers' Association, said Fifa was "not fit for purpose". He added: "If it was a school it would be under special measures. "The biggest and best game in the world deserves better - and it's got to do better. There are enough ethical people out there to make sure the job's done properly. "I'm surprised Sepp Blatter's still there. It's the best game in the world, but it's got the worst governance." The Swiss attorney general's office said Blatter was questioned on Friday and his office was searched. He faces a charge of criminal mismanagement or misappropriation, relating in part to a TV rights deal he signed with former Caribbean football chief Jack Warner in 2005. Warner is currently fighting extradition from Trinidad. In 2005, Blatter signed a contract for World Cup TV rights with the Caribbean Football Union, controlled by Warner. His company later sold the rights on for an $11m (£7.2m) profit. In May, Swiss authorities arrested seven Fifa officials in Zurich at the request of the US. One, Fifa vice president Jeffrey Webb, has already been extradited. Read more on Rooney, Aguero, Hazard, Costa, Sanchez & Kane: What is wrong?